Heritier O'Brien will now be known as Heritier Lumumba, his birth name. Harry O'Brien will now be known as Heritier Lumumba, his birth name. Heritier Lumumba runs down centre wing at the MCG earlier in 2013. A name has today been removed from Collingwood’s senior list. Fortunately it has not required an unexpected departure from the Westpac Centre. The 2010 premiership defender formerly known as Harry O’Brien has reclaimed his birth name and is to now be known as Heritier Lumumba (pronounced Heritee-ar La-moum-ba). Lumumba has divested himself of his anglicised Christian name and the O’Brien surname of his step-father he took at the age of nine to take back the name of his Congolese biological father. “The name Heritier means the inheritor or the heir...the inheritor is the inheritor of the Lumumba name and the name Lumumba is a very famous one in Africa, in particular the Democratic Republic of Congo. It’s a bit stronger than Harry O’Brien. 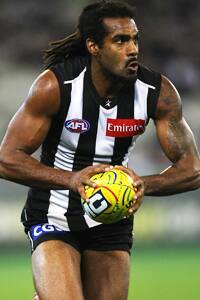 It’s Heritier Lumumba and it’s always resonated with me,” Lumumba told collingwoodfc.com.au. Lumumba’s decision has been warmly embraced by his team-mates, as Lumumba explains in full on CTV in the video above.